That a fundamental understanding of good and evil is shared by all human beings, regardless of cultural differences, is one proof of the existence of God for C.S. Lewis. 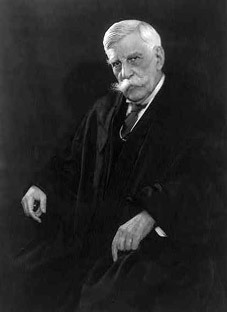 Oliver Wendell Holmes, Jr., one of America's greatest jurists, saw things quite differently. Born into a prominent Boston family and educated at Harvard University, he served courageously in the Union Army during the Civil War — an experience that profoundly affected his subsequent worldview. He went on to practice law, was appointed to the Massachusetts High Court at an early age, and then to the U.S. Supreme Court, where his tenure lasted 30 years. In this last role he became known as "The Great Dissenter" for the eloquence of his legal opinions, often in the minority. In this excerpt from a Harvard Law Review article written during the First Word War, Holmes argues that any human belief in a moral absolute is rooted in our psychological need to be right and certain — and not in the laws of nature, or in the nature of God. He goes on to assert that the relativity of all our values, even religious ones, need not diminish our passion for life, our commitment to those values, or our awe of a universe whose true nature we may never comprehend. It is not enough for the knight of romance that you agree that his lady is a very nice girl — if you do not admit that she is the best that God ever made or will make, you must fight. There is in all men a demand for the superlative, so much so that the poor devil who has no other way of reaching it attains it by getting drunk. It seems to me that this demand is at the bottom of the philosopher's effort to prove that truth is absolute and of the jurist's search for criteria of universal validity which he collects under the head of natural law. I used to say when I was young, that truth was the majority vote of that nation that could lick all others. Certainly we may expect that the received opinion about the present war will depend a good deal upon which side wins (I hope with all my soul it will be mine), and I think that the statement was correct insofar as it implied that our test of truth is a reference to either a present or an imagined future majority in favor of our view. If ... the truth may be defined as the system of my (intellectual) limitations, what gives it objectivity is the fact that I find my fellow man to a greater or less extent (never wholly) subject to the same Can't Helps. If I think that I am sitting at a table I find that the other persons present agree with me; so if I say that the sum of the angles of a triangle is equal to two right angles. If I am in a minority of one they send for a doctor or lock me up; and I am so far able to transcend the to me convincing testimony of my sense or my reason as to recognize that if I am alone probably something is wrong with my works. Certitude is not the test of certainty. We have been cocksure of many things that were not so. If I may quote myself again, property, friendship, and truth have a common root in time. One cannot be wrenched from the rocky crevices into which one has grown for many years without feeling that one is attacked in one's life. What we most love and revere generally is determined by early associations. I love granite rocks and barberry bushes, no doubt because with them were my earliest joys that reach back through the past eternity of my life. But while one's experience thus makes certain preferences dogmatic for oneself, recognition of how they came to be so leaves one able to see that others, poor souls, may be equally dogmatic about something else. And this again means skepticism. Not that one's belief or love does not remain. Not that we would not fight and die for it if important — we all, whether we know it or not, are fighting to make the kind of a world that we should like — but that we have learned to recognize that others will fight and die to make a different world, with equal sincerity or belief. Deep-seated preferences cannot be argued about — you cannot argue a man into liking a glass of beer — and therefore, when differences are sufficiently far reaching, we try to kill the other man rather than let him have his way. But that is perfectly consistent with admitting that, so far as appears, his grounds are just as good as ours. The jurists who believe in natural law seem to me to be in that naïve state of mind that accepts what has been familiar and accepted by all men everywhere. No doubt it is true that, so far as we can see ahead, some arrangements and the rudiments of familiar institutions seem to be necessary elements in any society that may spring from our own and that would seem to us to be civilized — some form of permanent association between the sexes — some residue of property individually owned — some mode of binding oneself to specified future conduct — at the bottom of all, some protection for the person. But without speculating whether a group is imaginable in which all but the last of these might disappear and the last be subject to qualifications that most of us would abhor, the question remains as to the Ought of natural law. It is true that beliefs and wishes have a transcendental basis in the sense that their foundation is arbitrary. You cannot help entertaining and feeling them, and there is an end of it. As an arbitrary fact people wish to live, and we say with various degrees of certainty that they can do so only on certain conditions. To do it they must eat and drink. That necessity is absolute. It is a necessity of less degree but practically general that they should live in society. If they live in society, so far as we can see, there are further conditions. Reason working on experience does tell us, no doubt, that if our wish to live continues, we can do it only on those terms. But that seems to me the whole of the matter. I see no a priori duty to live with others and in that way, but simply a statement of what I must do if I wish to remain alive. If I do live with others they tell me that I must do and abstain from doing various things or they will put the screws on to me. I believe that they will, and being of the same mind as to their conduct I not only accept the rules but come in time to accept them with sympathy and emotional affirmation and begin to talk about duties and rights. But for legal purposes a right is only the hypostasis of a prophecy — the imagination of a substance supporting the fact that the public force will be brought to bear upon those who do things said to contravene it — just as we talk of the force of gravitation accounting for the conduct of bodies in space. One phrase adds no more than the other to what we know without it. No doubt behind these legal rights is the fighting will of the subject to maintain them, and the spread of his emotions to the general rules by which they are maintained; but that does not seem to me the same thing as the supposed a priori discernment of a duty or the assertion of a preexisting right. A dog will fight for his bone. The most fundamental of the supposed preexisting rights — the right to life — is sacrificed without a scruple not only in war, but whenever the interest of society, that is, of the predominant power in the community, is thought to demand it. Whether that interest is the interest of mankind in the long run no one can tell, and as, in any event, to those who do not think with Kant and Hegel it is only an interest, the sanctity disappears. I remember a very tender-hearted judge being of opinion that closing a hatch to stop a fire and the destruction of a cargo was justified even if it was known that doing so would stifle a man below. It is idle to illustrate further, because to those who agree with me I am uttering commonplaces and to those who disagree I am ignoring the necessary foundations of thought. The a priori men generally call the dissentients superficial. But I do agree with them in believing that one's attitude on these matters is closely connected with one's general attitude toward the universe. Proximately, as has been suggested, it is determined largely by early associations and temperament, coupled with the desire to have an absolute guide. Men to a great extent believe what they want to — although I see in that no basis for a philosophy that tells us what we should want to want. Now when we come to our attitude toward the universe I do not see any rational ground for demanding the superlative — for being dissatisfied unless we are assured that our truth is cosmic truth, if there is such a thing — that the ultimates of a little creature on this little earth are the last word of the unimaginable whole. If a man sees no reason for believing that significance, consciousness and ideals are more than marks of the finite, that does not justify what has been familiar in French sceptics; getting upon a pedestal and professing to look with haughty scorn upon a world in ruins. The real conclusion is that the part cannot swallow the whole — that our categories are not, or may not be, adequate to formulate what we cannot know. If we believe that we come out of the universe, not it out of us, we must admit that we do not know what we are talking about when we speak of brute matter. We do know that a certain complex of energies can wag its tail and another can make syllogisms. These are among the powers of the unknown, and if, as may be, it has still greater powers that we cannot understand, as Fabre in his studies of instinct would have us believe, studies that gave Bergson one of the strongest strands for his philosophy and enabled Maeterlinck to make us fancy for a moment that we heard a clang from behind phenomena — if this be true, why should we not be content? Why should we employ the energy that is furnished to us by the cosmos to defy it and shake our fist at the sky? It seems to me silly. That the universe has in it more than we understand, that the private soldiers have not been told the plan of campaign, or even that there is one, rather than some vaster unthinkable to which every predicate is an impertinence, has no bearing upon our conduct. We still shall fight — all of us because we want to live, some, at least, because we want to realize our spontaneity and prove our powers, for the joy of it, and we may leave to the unknown the supposed final valuation of that which in any event has value to us. It is enough for us that the universe has produced us and has within it, as less than it, all that we believe and love. If we think of our existence not as that of a little god outside, but as that of a ganglion within, we have the infinite behind us. It gives us our only but our adequate significance. A grain of sand has the same, but what competent person supposes that he understands a grain of sand? That is as much beyond our grasp as man. If our imagination is strong enough to accept the vision of ourselves as parts inseverable from the rest, and to extend our final interest beyond the boundary of our skins, it justifies the sacrifice even of our lives for ends outside of ourselves. The motive, to be sure, is the common wants and ideals that we find in man. Philosophy does not furnish motives, but it shows men that they are not fools for doing what they already want to do. It opens to the forlorn hopes on which we throw ourselves away, the vista of the farthest stretch of human thought, the chords of a harmony that breathes from the unknown.